Palma de Mallorca, Andratx, Sant Antoni de Portmany, Ibiza, and more! The Balearic Islands have been made world famous by the “White Isle” of Ibiza’s hedonist summer of prestigious DJs at premium night clubs, attracting party lovers and celebrities galore. But there is much more to this archipelago than dance beats and cocktails. Of course Ibiza has the best gay beach of Europe: Platja de es Cavallet, and lots of gay bars in the old town and outside. Walk along the cobblestone streets of Palma and visit one of the most famous gothic cathedrals in Europe. The Palma Cathedral, also known as “La Seu,” or “the seat”, which refers to the bishop’s seat. Take in Palma’s historic atmosphere and charm. Boarding starts at 5 pm. Time to unpack your stuff, welcome drink and first briefing. Afterwards dine at one of many great restaurants. Spend overnight aboard. After a leisurely breakfast, set sail for Andratx. Along the rocky coastline, you’ll pass Cala Portals Vells beach. It’s popular with sailors. Rounding the cape you can try the golden, sandy beach at El Toro, which offers calm waters protected by Port Adriano. Once you reach the harbor of Andratx, one of the prettiest in Majorca, you can anchor there for the night. A long sail today to Ibiza Island. Lunch on our way. Overnight in one of Ibiza’s natural bays. Today we set sail to Sant Antoni de Portmany. The second largest town of Ibiza. Home of the famous Café del Mar, where we will the famous sunset cocktail. Dinner in town. Sailing around Ibiza, overnight in one of many stunning beautiful bays. 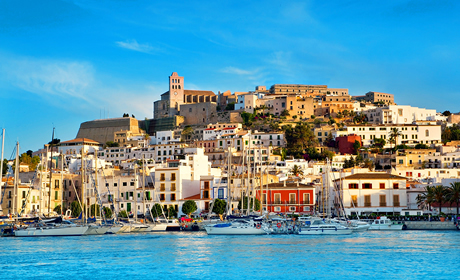 Our last sailing day of the first week will bring us to Eivissa, the capital of Ibiza. Dinner in the old citadel and after that party time in all the gay bars in town and dance until dawn! Time to say goodbye to your new friends for the guests who stay one week and disembark after breakfast. Fly to Palma de Mallorca Airport (PMI), Spain, from the US via Madrid or Barcelona. Airport transfers takes about 20 minutes by taxi. If you book a one week, you fly back home from Ibiza Airport (IBZ) or back to Mallorca with Air Europa or Iberia (40 min) or you can take the local ferry back to Mallorca - 2 to 4 hours. GaySail Special cruises are including the service of a gay skipper and a gay cook/co-skipper, accommodation on board, welcome drink, breakfast, lunch, harbor fees, taxes, gasoline and end cleaning. Not included: dinners & drinks.